By Philip Calvert It hit me the moment I stepped through the exit of Trivandrum airport in the state of Kerala, India. A blanket of warmth enveloped me – a rich mixture of balmy temperatures and the friendliest welcome I have ever received on arrival to speak at a conference. Emerging from the quiet coolness of the arrivals hall, I dived head first into the busy, bustling, bursting streets of Thiruvananthapuram and was whisked speedily to the wonderful Leela Hotel with its magnificent views of the Kovalam shoreline. The International Conference on Travel Technology India had been many months in the planning. It was a first-of-its-kind conference for travel operators, hoteliers and travel industry professionals in India to explore the considerable opportunities that Social Media and the Internet was presenting them. With twenty five presentations on every conceivable aspect of Social Media in the Travel industry, the conference was a triumph, with delegates from all over India being treated to a wealth of knowledge and sharing of best practice from a range of speakers from their homeland, the USA, the UK (myself) and Australia. What was particularly important and encouraging for delegates, was the clear and highly visible support from important dignitaries such as Oommen Chandy, Chief Minister of Kerala and Dr Shashi Tharoor, Minister of State for Human Resource Development – plus Anish Kumar, Organising Secretary for the Association of Tourism Trade Organisations India. All too often, politicians around the world talk a good talk when it comes to Social Media, but Shashi Tharoor sets his own trailblazing example, with over 1.8 million Twitter followers. To some extent there was mutual acknowledgement that, to date India might have missed a trick when it came to using Social Media to interact and engage with potential tourists to the country. But that was about to change. Indeed, the organisers of the International Conference on Travel Technology India had set an excellent example by effectively using Facebook for many months leading up to the event itself. This was my first visit to India, and I couldn’t have picked a better state for such a trip if I had tried. 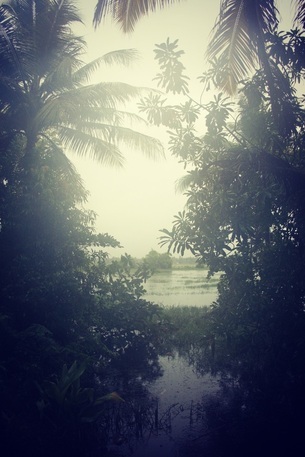 Kerala, AKA ‘God’s Own Country’ or ‘Land of Coconut Trees’ was simply stunning. India is extremely ‘full on’; everything about the country constantly assaults your senses – it’s sights, sounds, colours, aromas, food, spices, stunning landscapes, weather, culture, yoga, spirituality, history, its friendly people – oh, and its driving! A country better placed to explode onto the global tourism scene it would be hard to find. But the challenge for any country investing in the Internet to bring the tourists flocking, is not to necessarily view Social Media as a Sales and Marketing tool – tempting as it is. It’s abundantly clear that Social Media and Travel go hand in hand, and many of us are profoundly influenced in our travel purchasing decisions by people we know or are connected to online. Trust is a key issue, and whereas we once entrusted our choice of vacations to a local travel agent, increasingly we hand that responsibility to friends, relatives, fellow travellers – and very often complete strangers who enthusiastically write about their experiences in blogs, forums, tweets and review sites. The end of the travel agent is a long way off yet – indeed many are offering a range of added value and personal services which are of huge value to the traveller and travellers in a range of niches. But the Internet is here to stay, and those in the Travel industry are only limited by their imaginations as to how Social Media and Internet technologies can be employed to add value to global travellers. One of the most striking examples I have seen recently, and one that I talked about in my own presentations at the conference was the inevitable growth in crowd-sourced travel. Every year millions of people have conversations with their partners about where they would like to visit for this year’s vacation. Whereas once upon a time a trip to the local travel agent would follow, more and more of us immediately turn to our laptops or tablets, and within seconds beautiful photos are being clicked and swiped on the screen. However what if you really can’t make up your mind where you’d like to go. Well, increasing numbers of Apps will help you to decide – like KLM’s TripShake. Simply shake your mobile device and it chooses a destination for you! You can even make the booking there and then. But I predict a big increase in people asking their friends where they would suggest. Nothing new in that you might say – but what if you get the Internet to help. And that’s just what John Ellis and Laura Preston did when they decided they wanted to travel across the USA for a year. On February 1st 2013 they set off on their journey – guided only by the suggestions of their followers. They wouldn’t be the first people who wanted to travel across the US, but to be guaranteed of making the most of every inch of the journey, why not get suggestions from people and then put them to a vote. As at today, they have been on the road for 137 days, visited 13 states and completed 76 crowd-sourced suggestions for places to visit. Not only will the crowd-sourced suggestions be of benefit to John and Laura, they will of course be of value to countless other people who are looking for interesting places to visit in the USA. John and Laura are also documenting their travels in a glorious Blog, thus passing on their own feedback and suggestions to people to act on or ignore as they see fit. To the casual follower of their Blog, Instagram posts and tweets, there is also an extra dimension to all this, in that they have a feeling of involvement in John and Laura’s travels. They may not actually be physically there on the journey with them, but they can hop along for the ‘virtual ride’. Of course, India is just made for crowd-sourced travel. Many people would love to visit India, but could really benefit from some inside knowledge of great places to see. Again, tourist operators in India are only limited by their imaginations as to how they can use Social Media to engage with the curious traveller who is eager to explore “Incredible India???. Although the Incredible India marketing campaign was devised by the Ministry of Tourism as long ago as 2002, it is as relevant today as it was then. Even from my short trip, India is indeed an incredible and magical place to visit. Whilst I fully intend to visit again at the earliest possible opportunity, I have gone out of my way to connect with individuals through Social Media, so that I can keep up to date on developments in the tourism industry there. India has much to offer the discerning and the curious traveller – whether you are backpacking or travelling five star, and I for one couldn’t recommend it highly enough. Congratulations to the organisers of the International Conference on Travel Technology India. They took on a big task and not only carried it off with confidence and assurance, but took an important step forward in helping India to engage with the world’s travellers through Social Media. Thank you also to everyone who made me feel so welcome.